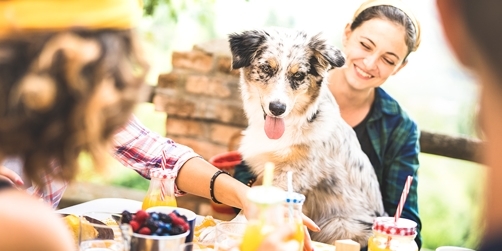 Whether it's your dog's birthday, you want to throw a Springtime bash or you're dying for a reason to have a weekend BBQ, here's the Ultimate Pup Paw-ty Guide to help you host one dog gone good time for your human and furry friends. You could base it on your dog’s breed, such as gold decorations for a Golden Retriever or a boxing theme for Boxers. Or, get inspiration from upcoming holidays or pop culture happenings. Choose a safe, outdoor location like a fenced-in backyard with lots of space to play and rest. 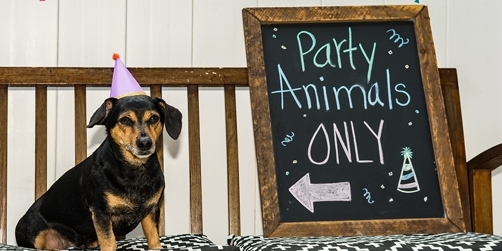 Send out invites to your pup's closest pals! Be sure that all invited dogs are well socialized and up-to-date on vaccines. If young children will be at the paw-ty, make sure all four-legged guests do well around kids. If it's your pup’s birthday celebration, ask that guests donate money to a local shelter or animal charity instead of bringing a present. Any good celebration must have cake! Check out this recipe for Peanut Butter Delight Pupcakes. You could also set up a bone bar for guests to customize treats with their pup’s favorite toppings. For other treat ideas, check out our recent post on homemade dog treats. Remember to have treats for the human guests too, just plan to keep them out of reach of sneaky dogs. You may want to label what food is for which guests – your two-legged guests wouldn't want any unpleasant surprises. Make it memorable! Prepare goodie bags for guests to take home- fill with a handful of treats, a tennis ball and a snazzy bandana. Set up a photo booth or backdrop with fun props. If you don’t ‘gram it, did it even happen? Clean up the yard of all dog droppings, broken toys, mushrooms, and any other potentially unsafe objects and let your neighbors know that you're having a party so they aren't surprised if they hear a few dogs barking. Day Of: It’s Paw-ty Time! Put out a few water bowls and refill with fresh, cold water regularly. If the forecast is hot, make sure there's ample shade or an easy way to go inside to cool off. Fill up a kiddie pool with cool water for pups to splash and play in. If you do have a pool, set out a pile of towels ahead of time. Keep an eye on the dogs at all times to make sure everyone plays nice. Look out for defensive or aggressive behavior and separate any dogs that seem to be bothering each other. Be sure to give your pup love and attention throughout the day – if your dog isn’t getting the attention they are used to, it might cause unwanted behavior. 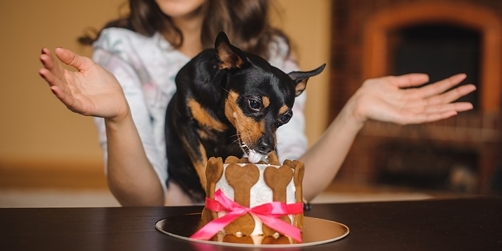 What do you and your pooch have to celebrate? Be sure to take pictures of your Pup Paw-ty and share them with us on Facebook or Instagram.